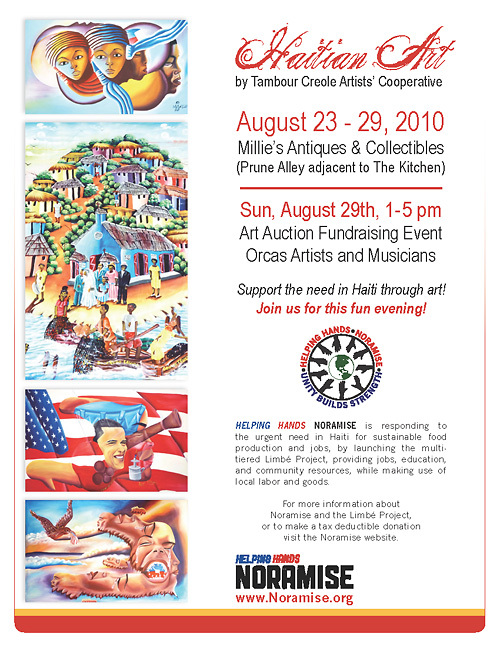 Support the need in Haiti through art! Join us for this fun evening! 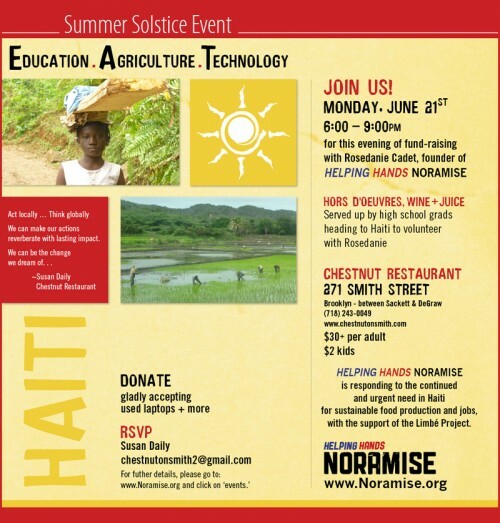 The proceeds of this benefit will help students at a low cost school in Limbé, Haiti as well as a vocational highschool to be built by Team Noramise and a local family. Team Noramise is mobilizing for the next trip to Haiti, in early May. For information or interviews, please contact Rosedanie Cadet at rosedanie@noramise.org, or call (360) 420-1331. 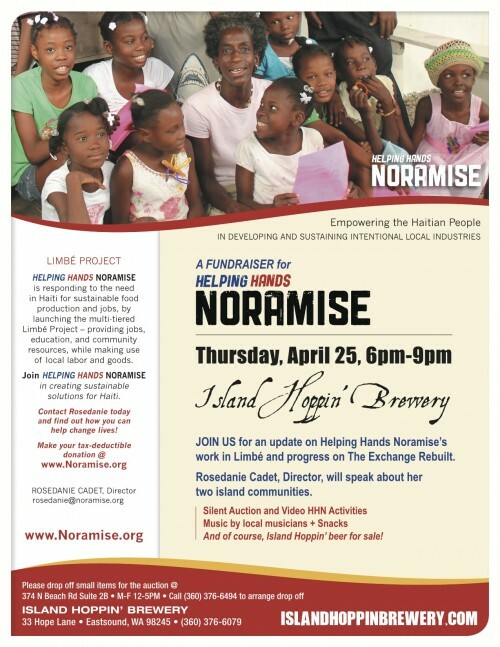 Thank you for your interest and support of Helping Hands Noramise! Come meet and talk with Steve and Taylor Diepenbrock, Tobias Tanenbaum and Rosedanie Cadet, who all traveled to Haiti last month, and hear more about the Limbé Project. Also meet the other members of the team working on Orcas and in Bellingham. There will be a 10-minute showing of some footage of the work done in Haiti. Come find out how you can be part of this project! Refreshments will be provided. 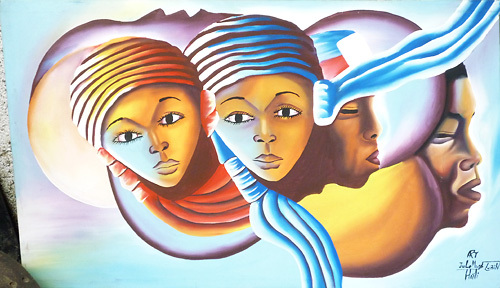 Painting by a young artist in Limbé, Haiti. Founder and director Rosedanie Cadet will be joining us to share about her recent trip to her family’s hometown in Limbé, Haiti. 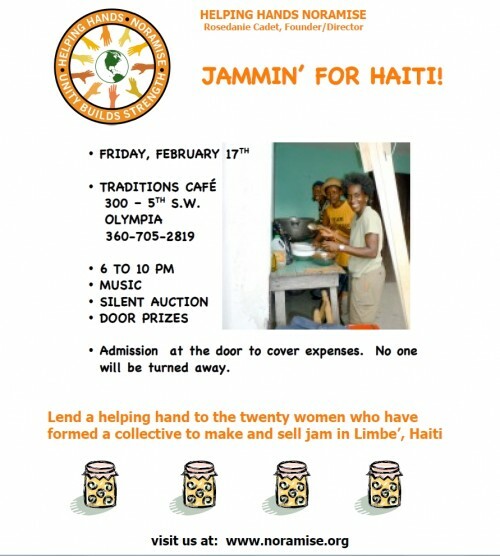 Come join us and see first hand what’s really going on in Haiti. This is a free event! 4-7pm: Silent Auction with baked goods for sale and music provided by some of Bellingham’s finest. 7pm: Presentation by Rosedanie Cadet. For more information, please contact Julie Connell at 360-303-3108. 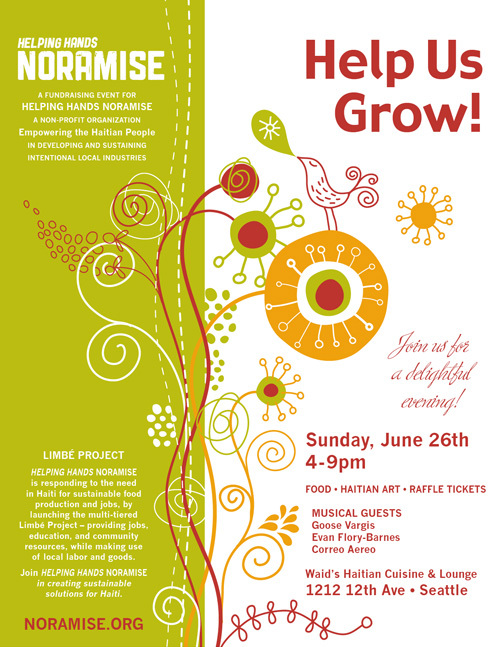 A fundraising event is being held on behalf of Helping Hands Noramise and the Limbé Project. This event will feature a variety of dance performances, food, and lots of fun! Show begins at 7pm at 1215 Cornwall Ave, Bellingham, WA. 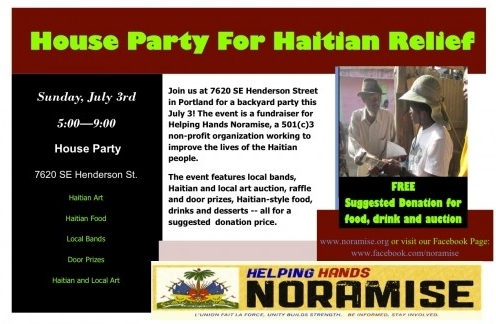 Rosedanie Cadet and Steve Diepenbrock will be speaking about Helping Hands Noramise and their service work in Limbé, Haiti. This presentation is hosted by the Sister Island Project, a non-profit organization working in the Dominican Republic. This is a great opportunity to learn about what’s going on in Haiti and to support Noramise’s ongoing work. Please join us! 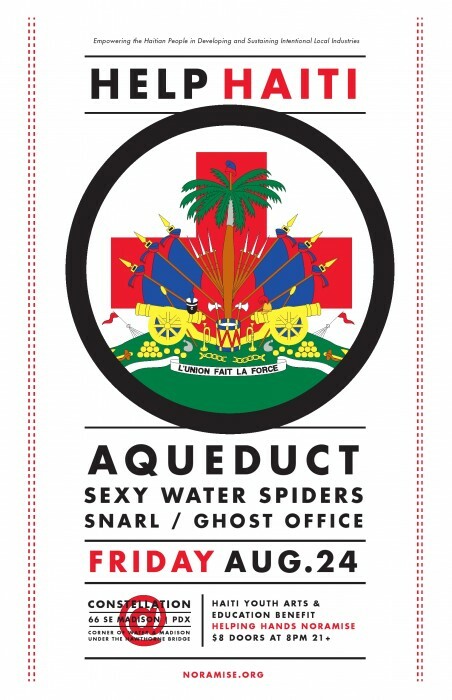 This free event is sponsored by Sister Island Project. For more info, contact Peter or Victoria at 360-321-4012 or by email at sisterisland@gmail.com. Download the PDF invite here, and pass it on to your friends. Helping Hands Noramise is Being Featured in a Documentary Film by Bay of Rainbows Productions! When documentary filmmakers Posie Currin and Nicole Vulcan, of Portland, Oregon-based Bay of Rainbows Productions, heard about Helping Hands Noramise, they just knew they had to document the work Rosedanie and the team are doing in Haiti. On March 1, 2010 the women are flying to the Dominican Republic, along with Annie Jordan, and taking the bus on to Limbé, Haiti. Bringing camera gear, some meager personal provisions, and whatever supplies they can carry to help the people in Haiti, the crew is grateful for this chance to get involved. In March 2010, Bay of Rainbows’ Posie Currin and Nicole Vulcan, along with Annie Jordan, traveled to Limbé, Haiti to document the work of Washington state-based relief organization Helping Hands Noramise. The organization is working to restore sustainable agriculture, foster cultural arts and traditional trades, and improve basic infrastructure by working directly with groups and individuals in the town of Limbé. Bay of Rainbows is in the shooting phase of this project, capturing the group’s efforts to tip the tenuous balance back in the town of Limbé and beyond. Stay tuned at bayofrainbows.com/projects for more on the production of this documentary work.